Born in Rome, Italy, Pope Urban I was elected pope after the death of Callixtus I on October 14, 222, and died on October 19, 230. He served during the reign of Emperor Alexander Severus and was succeeded by Pontian. He is mentioned by Eusebius in his church history and is named in an inscription in the Coemeterium Callisti, but little is known of his life and works outside of later legendary accounts. The Roman Church seems to have enjoyed a period of peace during his reign, as the emperor allowed various sects to flourish and his mother was favorably disposed toward the Christians in particular. Nevertheless, tradition holds that Urban I was martyred during a persecution by a Roman governor in which Saint Cecilia also lost her life. Although there is some confusion between this Urban and another saint of the same name who also died at Rome, his feast is celebrated on October 19. Seven of Urban's successors as pope have taken his name. According to the Liber Pontificalis, Urban was a Roman and his father's name was Pontianus. Beyond this, nothing is known of his early life. After the death of Callixtus I on October 14, 222, Urban was elected bishop of Rome, where he would serve for eight years, according to Eusebius (Hist. eccl., VI, 23). The Liber Pontificalis portrays Urban as an effective preacher who converted many by his sermons. Another report tells us that Urban ordered the making of silver liturgical vessels. The dissension produced in the Roman Church by Hippolytus, the bitter opponent of Pope Callixtus I, continued to exist during Urban's pontificate. Hippolytus and his adherents persisted in this schism, with Hippolytus as their antipope. It was probably during the reign of Urban that Hippolytus wrote his Philosophumena, in which he criticized heresy of all types but also attacked Callixtus, as well as his predecessor Zephyrinus, severely. Urban maintained the same attitude toward the schismatic party and its leader that his predecessor had adopted. Later, during or shortly after the papacy of Pontian (230–235), Hippolytus would reconcile himself to the main body of the Church and would eventually be recognized himself as a saint. The historical sources give no specific details concerning the other factions troubling the life of the Roman Church during this specific era, but it is certain that they existed. Gnosticism, Montanism, Sabellianism, and Novatianism, for example, all continued to challenge the Church both before and after Urban's papacy. In 222, shortly before Urban's election, Alexander Severus became Roman emperor. He favored a religious eclecticism and also protected Christianity. His mother, Julia Mammaea, was reputed to be a Christian, and was clearly a friend of the Alexandrian Christian teacher Origen, whom she summoned to Antioch. Hippolytus dedicated his work on the Resurrection to her. The result of the favorable opinion of Christianity held by the emperor and his mother was such that Christians enjoyed nearly complete peace and were not persecuted, although their legal status was not changed. The major exception to this, if historically accurate, is the story which explains why Urban's election became necessary: the martyrdom of his predecessor Calixtus in an act of mob violence. 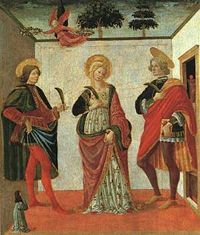 The legendary accounts of the persecution of Urban and his fellow saint, Cecelia, (see below) are unconfirmed and considered unlikely by most scholars. In fact, the historian Lampridius (Alex. Sever., c. xxii) says emphatically that Alexander made no trouble for the Christians: "Christianos esse passus est." Alexander Severus even sided with the Roman Christians in a legal dispute over the ownership of a piece of land. When they wished to build a church on a lot which was also claimed by tavern-keepers, the matter was brought before the imperial court, and Severus decided in favor of the Christians, declaring it was better that even the Christian god should be worshiped on that spot, than that it be devoted to revelry (Lampridius, "Alex. Sever.," c. xlix). The increase in the extent of various Roman catacombs in the first half of the third century shows that Christians grew substantially in numbers during this period. The Acts of Saint Cecilia connect this saint with Urban, who is said to have baptized her husband and her brother-in-law. The story of the martyrdom of Urban himself, which are of a still later date than the legend of St. Cecilia, must be considered apocryphal. The Liber Pontificalis states that he became a confessor during the reign of Diocletian. However, since this would mean Urban was still alive at the time of his supposed martyrdom with Cecilia, we must conclude that the true particulars of the death of Urban are unknown. Two different possibilities exist as to the grave of Urban. In the Acts of Saint Cecilia and the Liber Pontificalis, it is said that Urban was buried in the Catacomb of Praetextatus on the Via Appia. Moreover, the itineraries of the graves of the Roman martyrs in the seventh century all mention the grave of a person named Urban who is among those buried in the Catacomb of Praetextatus. These itineraries gives this Urban the title "Bishop and Confessor." Consequently Roman tradition venerated the pope of this name as the Bishop Urban of the Catacomb of Praetextatus. The second possibility results from later evidence indicating that Pope Urban may have been buried in the nearby cemetery of Saint Callixtus while the Urban buried at Saint Praetextatus was the bishop of another see who died at Rome. "The gifts of the faithful that are offered to the Lord can only be used for ecclesiastical purposes, for the common good of the Christian community, and for the poor; for they are the consecrated gifts of the faithful, the atonement offering of sinners, and the patrimony of the needy." The story that was once included in the Catholic Church's Breviary on May 25 speaks of Urban's numerous converts, among whom were Valerianus, husband of Saint Cecilia, and his brother Tiburtius. However, his feast as a saint is celebrated on May 19 while it is another Saint Urban—possibly the one buried in the Catacomb of Praetextatus—whose feast is on May 25. Saint Cecilia with her husband and brother, traditionally believed to be converted to Christianity by Pope Urban. A certain Almachius, a provost of Rome, was the principal governor of the city. Although the emperor himself was tolerant of Christianity, Almachius had persecuted them, especially Cecelia, whom he had beheaded. Almachius' servant, Carpasius, discovered Urban hiding in a dark and secret place with three priests and three deacons. Urban was accused of conspiring with Cecelia to deceive 5,000 persons to join the Christian faith, including the noblemen Tiburtius and Valerianus. Almachius demanded that Urban yield to him the treasure of Saint Cecilia and of the church. Urban replied: "I see now that covetousness moves you more to persecute the Christians than does the sacrifice of your gods. The treasure of Saint Cecilia is ascended into heaven by the hands of poor people." Almachius severely tortured Saint Urban and his fellows, but when he saw that he could not overcome Urban's faith, he commanded him to be sent again to prison. There, Urban converted and baptized three captains of the town and the keeper of the prison, Anolinus. When the tyrant heard that Anolinus had become a Christian, he attempted to force him to sacrifice to the Roman gods, and beheaded him when he declined to do so. He then brought Urban and his comrades before the Roman idol, whereupon Urban began pray to the true God. The idol immediately fell down and slew 22 pagan priests. The Christian confessors were then cruelly beaten and brought again to engage in pagan sacrifice. They spit at the idol, made the sign of the cross in their foreheads, and kissed each other. Urban and his friends finally received the ultimate penalty and were beheaded. Often he is found sitting wearing the papal piara or a bishop's mitre, robes, and holding a sword pointed towards the ground. ↑ Martyrologium Romanum (Libreria Editrice Vaticana, 2001, ISBN 88-209-7210-7). ↑ Calendarium Romanum (Libreria Editrice Vaticana, 1969), 124. History of "Pope Urban I"
This page was last modified on 22 May 2015, at 20:50.